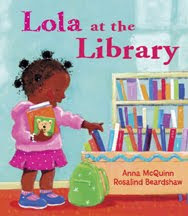 Anna McQuinn's series about that spunky book lover Lola is a favorite amongst children, teachers, and librarians. With the third book in the series coming out in February (Lola Reads to Leo), Charlesbridge took a moment to ask the UK author and librarian some questions about the series. Charlesbridge: Where did the character of Lola come from? Anna McQuinn: Lola started out as a little girl having some first experiences--I planned to have her go to the library, to a cafe, a swimming pool . . . I started with the library story--probably influenced by the fact that I had just started working part-time running mom and toddler groups in a library. Some of my experiences influenced the story: in my outreach work I realized that many parents were still reluctant to bring little kids into libraries in case they disturbed other readers and I found myself explaining that we had an area for children and they wouldn't be disturbing anyone; I also found myself explaining that little children could enjoy books long before they could read--an argument I'd thought was long won. However, as I wrote the story, Lola turned into a little book lover--and by the time I'd finished the story, she had a fully-developed character in my head: a book enthusiast who loved going to the library. Happily, Rosalind Beardshaw, the illustrator, totally captured this enthusiasm, so as the drawings came in, Lola's personality developed in my head. I think this personality comes out more in the second story, Lola Loves Stories, but it really wasn't until I read the jacket copy on the newest book, Lola Reads to Leo, that I realized how much of myself there was in Lola. When I was little, I loved stories--my grandfather was a great storyteller and my dad told us stories every night in bed. As soon as I learned to read, I read constantly--at night by the streetlight outside my window (when I was supposed to be sleeping) and at every other available opportunity (the back of the shampoo bottle when I went to the bathroom, the back of the cereal packet while eating breakfast . . .). All of these stories opened up a huge world of possibilities for me. CB: The books in this series are first published in the UK, where you live, and then re-published in the U.S. (and other countries!) with some alterations. For example, "Lola" is actually "Lulu" in the UK versions. How does this influence the way you write Lola's adventures, if at all? 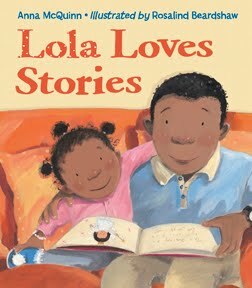 AM: Lola started out as Lola--the name came at exactly the same time as her character, as a package. Then, just before Lola at the Library was published, the Charlie and Lola books were televised here in the UK and much to my disappointment, I realized that people would be confused. Happily it wasn't an issue for the U.S., but for the UK edition I searched desperately for a new name, but nothing worked. Then one day, my mom and toddler group was at the park and I heard a Somali mum call her child Lulu. It was perfect--as close as I could get to Lola. Funnily enough, it doesn't influence how I feel about her. Most of the time I write the story calling her Lola--par tly because the first person I show the draft story to is Yolanda Scott, the Editorial Director at Charlesbridge. Then I just change it for the UK. The names are so close it's almost like a friend whose family has a nickname for her (my family call me Anzi, so maybe that's why I barely think about it). In the Netherlands, she's called Bibi (to alliterate with "bieb," which means "library") and weirdly that also seems to suit her so well that it doesn't cause me a second thought (though the file names for the documents on my computer are all over the place!). I'd love to know what she's called in Korea where Lola Loves Stories was recently published, but I can't read the script. CB: Like Lola, you love to read as well. What types of books are you drawn to the most? AM: I've been going through a crime novel phase for about ten years now. It started when I was in a very difficult job and reading stories where the bad guys always got their comeuppance satisfied some big need in my soul! I did my M.A. in the Gothic Novel and used to think that was the link but I've recently read that crime novels are like fairytales for adults--that's my story and I'm sticking to it. My favorites are Walter Mosley, Harlan Coben, Sara Paretsky, Laura Lippman, and Michael Connelly. In between crime novels, I read a huge variety of things. I'm really drawn to stories which feature children or a child's view of things. One of my favorite books is The Butcher Boy by Patrick McCabe--I think anyone working with children should be made to read it--and another is Orange Mint and Honey by Carleen Brice. This year I really enjoyed Room by Emma Donoghue; America Is Me by E.R. Frank; The True Story of Hansel and Gretel by Louise Murphy; The Story by Faiza Guene; and We Are All Made of Glue by Marina Lewycka (which has nothing to do with children). I'm addicted to Goodreads and I log on every few days to share recommendations and see what my friends are reading. CB: What do you hope readers will take away from the books in the Lola series? AM: I hope that little kids will be inspired by Lola to check out the wonderful world that books and stories and reading can open up for them. I see from my work that many children need the tiniest prompt (which Lola provides) to be the characters from their stories: fairies and tigers and pilots . . . so I hope Lola will help them to take that first step from the story on the page to the story in their minds--I hope that little girls in particular will see that they can be anything, not just princesses! I would love parents to see that finding books which children enjoy reading is the most important thing for these little ones. I'm saddened when I see parents pushing their choices--especially books which are for older children or to what parents feel is right for boys/girls. For many little boys as well as little girls in my group, Lola is their favorite book. And while black children love her, she is also much loved by Chinese, Polish, Spanish, and Lebanese alike--mostly they are responding to seeing their familiar world represented in a simple story. CB: What's next for Lola? Any new adventures we can look forward to? AM: I've already started work on the next story--Lola's mommy gives her a section of their community garden and, of course, before she can decide what to grow, she has to go to the library to research . . . Leo is also developing a little personality in my head, so look out for him appearing in his own story. 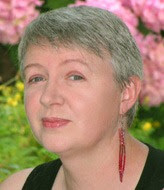 Do you have some questions for Anna McQuinn? Email us at trademarketing@charlesbridge.com to sign up for the Lola Blog Tour. Don't have a blog? You can still ask Anna your questions--we'll post your interview here on Unabridged! I’ve fallen in love with Lola just by reading your description. With her love of books I find her hard to resist. 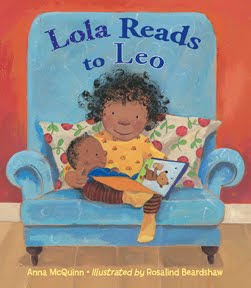 I placed my order for the first in the series and I look forward to reading Lola Reads to Leo in February.